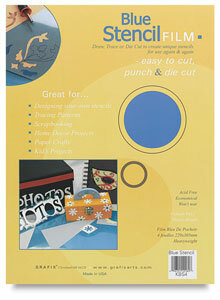 Tough, non-tear Mylar stencil film lets you create or copy designs and turn them instantly into templates. Simply draw or trace your design with a pen, cut out with scissors or utility knife, and you're ready to stencil. Each sheet measures .007" (0.178 mm) thick. ® Grafix is a registered trademark.® Mylar is a registered trademark.